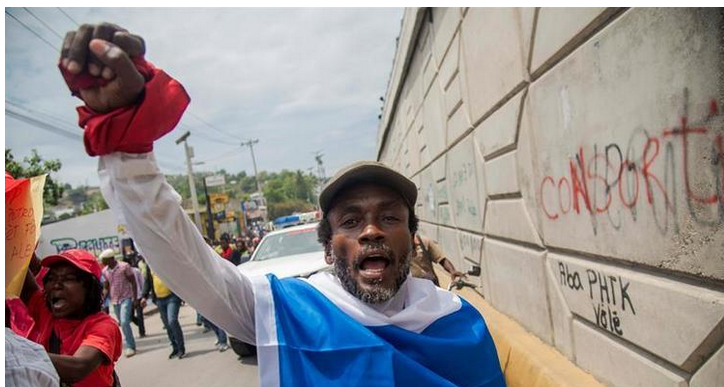 Hundreds of people protested in the streets of Port-au-Prince Friday, demanding the resignation of Haitian President Jovenel Moise during a day of mobilization that ended without major incidents and is the first after the violent protests in February. “The first responsible is Jovenel Moise, who does not want to listen to the voice of the people. Today we are re-launching the protests and we are going to continue until Jovenel leaves”, he claimed. “For me it is important to be in the street to say NO to this system, I will always be there to ask for profound changes in the country. We are not going to accept that only politicians and the rich can function normally in this country,” Carlo Pierre-Paul, one of the demonstrators said Friday. On Mar. 27, the Chilean ambassador to Haiti, Patricio Utreras, was the victim of an armed attack whilst he was on his way to a attend a solidarity activity northeast of the Caribbean nation’s capital. Haiti is going through a deep economic and political crisis after the widespread and violent two-week protests that began on Feb. 7, the same day that Jovenel Moise had served two years in office. An audit revealed irregularities in this program between 2008 and 2016, involving 15 former ministers and current officials, as well as a company Moise ran before he became president. I think the operational word here is “ hundreds” when referring to demonstrators. Hundreds, from a population base of more than 12,000,000 should tell you something. Additionally, something over $1,000,000 USD were spent on the March 29 demonstration, generating a few hundred says it all. The people, the real majority, are tired of the chaos that disrupts their individual efforts towards minimal survival. The media also ignores the fact that the demonstrations are paid for by drug dealers and businessmen who don’t want stability. Their fortunes depend upon chaos. We are heading for an explosion that will stun everyone. Many will die.